Who would leave the starting rotation if the Phillies reacquire Cole Hamels? BALTIMORE — Cole Hamels stays in touch with enough of his former teammates to know that the Phillies will honor the 2008 World Series champions before the Aug. 5 game at Citizens Bank Park. He also knows there's only one way he would be able to attend the ceremony. And don't think for a second that the ex-Phillies ace hasn't considered it. "I think that's kind of the pipe dream of it," Hamels said over the weekend. "That's the perfect scenario. Everything has to cross." The thing is, it isn't particularly difficult to imagine a Phillies-Hamels reunion. Far stranger things have happened. Baseball's trade deadline is two weeks away, and Hamels is all but certain to be traded by the Texas Rangers, who entered the all-star break in last place in the American League West. The 34-year-old lefty is 5-8 with a 4.36 ERA through 19 starts this season and has a $20 million club option (or $6 million buyout) for next year that the Rangers are unlikely to exercise. >>READ MORE: Is Chase Utley a Hall of Famer? The Phillies, meanwhile, are unexpectedly in first place in the National League East, making them trade-deadline buyers for the first time since 2011. Their priority is finding another hitter, preferably a third baseman or shortstop, and having realized a legitimate chance to win the division, they have been focused on Baltimore Orioles star Manny Machado. Starting pitching has been a strength. But it's likely the Phillies will have to dip into their stable of pitching depth in any deal for an impact hitter. Acquiring Hamels could soften the blow of trading, say, Zach Eflin to the Orioles as part of a package for Machado. Hamels would welcome a return, too. He and his wife still have a home in Delaware County, and their children attend Episcopal Academy. He also has been impressed with the Phillies' expedited rebuild, which is running about one year ahead of even the team's internal projections. "If something like that does happen, I think it would be a blessing," Hamels said. "You do look back. And Philly has a great group of guys that they're bringing up and the future of a world championship team. You just have to give it to them and give them their space. If it happens, it happens. But I can't wish or long for something like that because I'm still trying to figure out how to pitch well in five days, six days." Hamels isn't quite the elite pitcher that he was when the Phillies traded him to Texas at the 2015 deadline with Jake Diekman and cash for Jorge Alfaro, Nick Williams, Jerad Eickhoff, Jake Thompson, Alec Asher and Matt Harrison. But the 2008 World Series MVP possesses the long track record of reliability that Eflin and fellow righthanders Nick Pivetta and Vince Velasquez have not yet established. It's doubtful, too, that the Rangers will receive more than a few mid-level prospects in return for him, even though the trade market for starting pitchers isn't particularly robust. Over his last four starts, Hamels has given up 18 earned runs in 17 innings. But he insists he's healthy and ready for a strong second half of the season. One encouraging sign for potential suitors: Hamels has a 2.93 ERA in 10 starts on the road compared to a 5.83 ERA in nine home starts. "I still feel good, healthy and fresh," said Hamels, who gave up four runs in 6 1/3 innings Friday night in a 5-4 victory over the Orioles. "I feel healthy and the ball is finally starting to come out the way that I'm used to. It's just a matter of trying to get the results to just kind of go with it, and I think that's what you have to do to convince people that you're good to go." 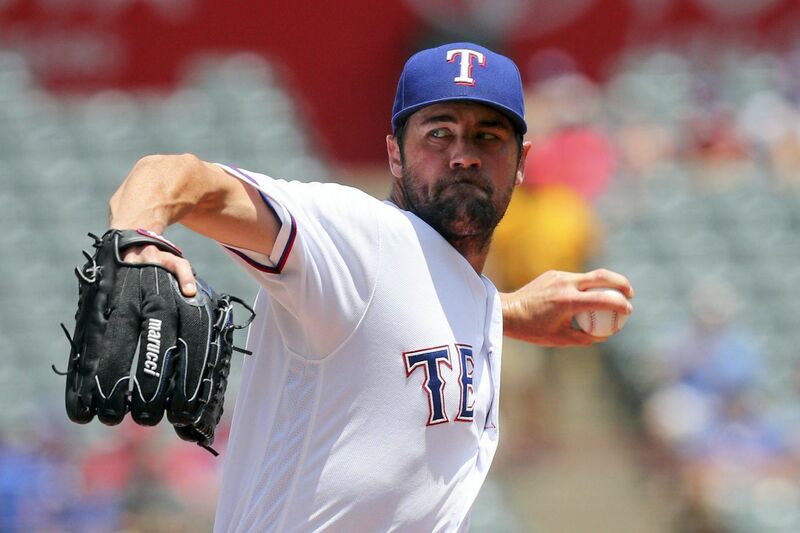 Hamels said the Rangers haven't clued him in on the likelihood of a trade. He doesn't expect them to, either, unless they have a deal worked out with a team that is on his no-trade list. The Phillies don't fall into that category. "I understand the situation I'm in, I understand the situation [the Phillies] are in, and I understand the control I don't have," Hamels said. "At the same time, I have to focus on this [Rangers] team and what we've got going on here. This is where I wanted to be and this is the team I was wanting to get traded to [in 2015], and Philly made it happen. I'm thankful that they did that. I know they didn't do it on purpose, but things lined up and it happened." Three years later, Hamels has to be wondering if another trade could bring his career full circle.